"Sampath Speaking" - the thoughts of an Insurer from Thiruvallikkeni: Carrom ~ Kajal Kumari won Swiss League ! My friend asked me how much of other Sports I follow ? – I wrote about this – and he was angry !! It was MSD all the way – master class Dhoni finished another match, with Virat Kohli and Kedar Jadhav batting well and earlier Yuzvendra Chahal bamboozling with 6 for 42 at Melbourne .. .. then the Capt Virat Kohli and his actress wife Anushka Sharma enjoyed some more special and memorable moments in Australia signing off in the most stylish way possible. Kohli and Anushka went to watch the first Grand Slam of 2019 - Australia Open - that is being played at the Melbourne Park. Not just that, they met the legendary Roger Federer, who is aiming to win this third consecutive Australian title. – some other search took me to this winner in Swiss League, honestly, I have not heard of this nor followed this when this occurred in Aug 2018 !!! 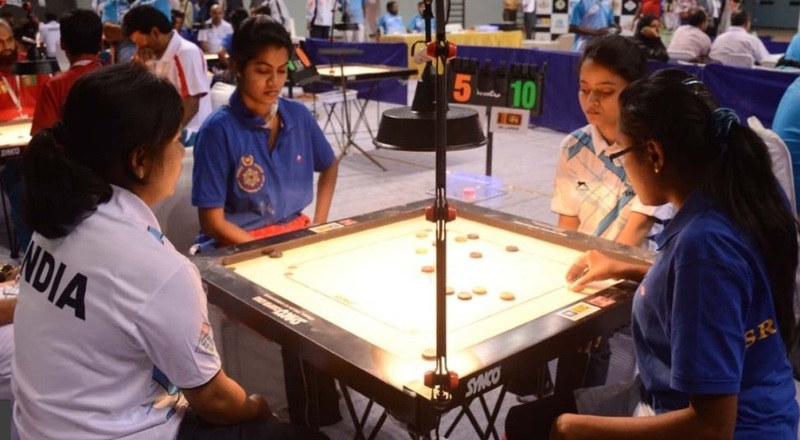 The Indian women outplayed Sri Lanka 3-0 in the team championship final of the fifth Carrom World Cup in Chuncheon, Korea, in 2018. However, the Indian men continued to find the reigning World Champions Sri Lanka a tough nut to crack and got beaten 2-1 in the final. Rashmi Kumari, Kajal Kumari and S. Apoorva helped India beat Sri Lanka without dropping a game for the women’s title. Rayana Fathimath of Maldives had put up a better fight against Kajal Kumari, the Swiss League champion the previous day, in the semifinals, but could not stop India recording a 3-0 victory in the semifinals. In the men’s final, Zaheer Pasha gave a good start for India by beating Shaheed HIlmy, but Nishantha Fernando and Chamil Cooray asserted Sri Lanka’s supremacy in the other two matches against Sagayabharathi and Prashant More respectively. In the Swiss League, the Winner was Kajal Kumari (India) – the runner-up was Chamil Cooray (Sri Lanka) ~ interesting for the simple reason that a woman outscored a man in a Sports ! 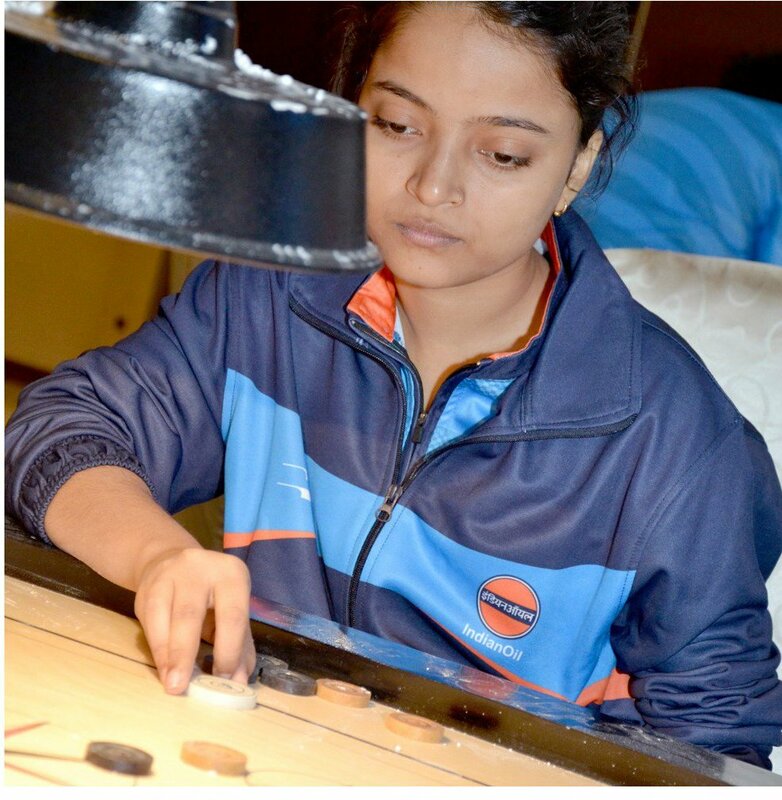 Kajal Kumari (born 1999) is an Indian female carrom player who represents India internationally and is employed by Indian Oil Corporation. During the 2018 Carrom World Cup, she created history by becoming the first ever woman to clinch the overall combined Swiss League title after defeating defending Swiss League champion Chamil Cooray of Sri Lanka in the combined Swiss League final. Before you read further, have you heard of : Appa Rao; Lazar, Dilli, Radhakrishnan, Nagsen Etambe, RM Shankara, .. Maria Irudayam and more …. Some of legendary players of an enticing game ! ~ the Carrom board. A game that can be played with a min of 2 and max of 4 players – Red (Queen) at the centre, surrounded in a formation by White and Black. The opener starts with a hit trying to pocket Whites while the opponent will have Black to dispense with. In doubles, four persons comprising two teams, sit opposite to each other, occupying all the four sides. At the end of each board, a player gets one point for each carrommen of the opponent left on the board and 3 points for the Queen if already pocketed and covered by him. The official recognition for a Carrom player came only once, in the form of A Maria Irudayam, Two World title and 9 national crown winner getting Arjuna award. She started playing carrom in 2005 and also went onto compete in state level carrom championships, Kajal Kumari later emerged as one of the finest carrom players in the state level competitions and went onto represent India at Carrom World Championships and in the Carrom World Cup tournaments. Kajal was part of the Indian women's carrom squad which won the 2014 Carrom World Cup title defeating Sri Lanka in the final. She also secured bronze medal in the women's singles at the 2014 World Cup with gold medal eventually secured by fellow Indian Rashmi Kumari. Kajal Kumari was also one of the key members of the Indian team which won the 2016 Carrom World Championship beating India in the final and also won the women's doubles with S Apoorva. She played a pivotal role in India's defense at the 2018 Carrom World Cup where India thrashed Sri Lanka 3-0 in the final. In the format known as Swiss league, it was woman power to the fore as 20-year-old Kajal Kumari tamed a 86-member field, that included 55 men, by scoring a maximum of 14 points from seven rounds in the Swiss league of the fifth Carrom World Cup at South Korea. “I am happy to win a tough competition as there are so many good players from India and Sri Lanka,’’ said Kajal. In topping the league, with all rounds played through the course of a day, Kajal beat the reigning World Champion Chamil Cooray of Sri Lanka, and also the India No.1 Riyaz Akbarali. Interestingly, it was the first time a woman was winning the combined event in the history of the game. In the league, played in a format of 45 minutes, 25 points and eight boards, whichever is earlier, four players tied for the second spot with 12 points. Chaml Cooray placed second, and K. Sagayabharathi was third on the basis of their better net score. Prashant More of India and Azim Ali of Maldives were fourth and fifth respectively. The competition, featured 17 countries, including Switzerland, Korea, Pakistan, Malaysia, Japan, France, Germany, US, Poland and Serbia.